Confocal imaging is based on the principle of point-source illumination and pinhole light detection. Out-of-focus signals are removed and optical sectioning is narrowed so that cellular level images can be produced. These optical biopsies can potentially target lesions for bronchoscopic sampling and eventually facilitate a noninvasive diagnosis. Optical biopsies may also be used to monitor either disease progression or therapeutic response. Using a probe-based version of confocal microscopy with a proximal scanning unit located outside the scope, airways and distal airspaces can be studied using standard flexible bronchoscopy. A 488-nm excitation light facilitates imaging of the elastin component of the pulmonary connective tissue. Elastin fibers are concentrated in the basement membrane of the bronchi, as well as the axial framework of alveolar ducts and alveolar entrance rings. Confocal imaging is further enhanced by the presence of mobile, fluorescent macrophages in smokers and by the use of exogenous fluorophores such as intravenous fluorescein or topical methylene blue. The safety profile of this technology has been established, and reproducible images of normal lungs have been obtained. With emerging data showing that elastin structures become disorganized in both malignant and nonmalignant disease, continued research is needed to characterize pathological lesions. Further developments to visualize the epithelial cell layer will also be needed before confocal imaging can become an established tool in diagnostic bronchoscopy. Dr. David S. Wilson, FCCP from the Lung Institute at Columbus Regional Hospital, Columbus, Indiana, USA, provided the confocal images in Figs. 22.3, 22.3, 22.4, 22.5, 22.7, 22.8, and 22.10. Thiberville L, Salaün M, Bourg Heckly G. In vivo confocal microendoscopy: from the proximal bronchus down to the pulmonary acinus, chapter 6. 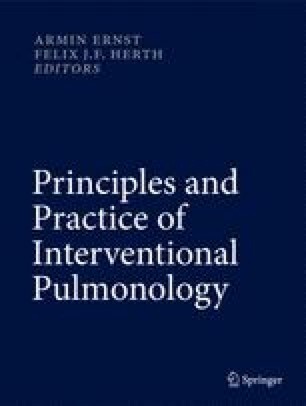 Published in: Interventional Pulmonology Edited by Strausz J, Bolliger CT. Eur Respir Soc Monograph. 2010;48:73–89.